Hide your spoons, people! 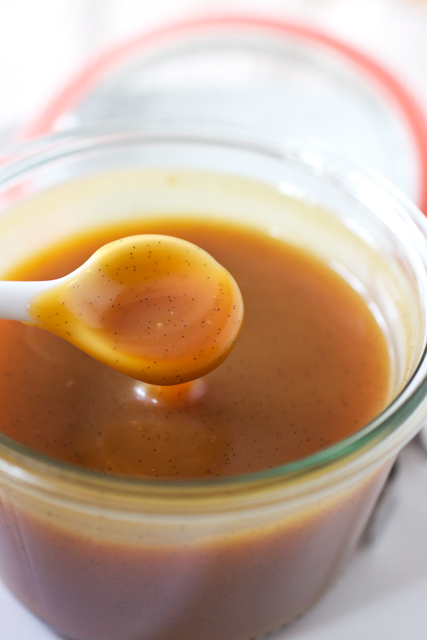 This vanilla bean caramel sauce is completely impossible to resist spooning over everything! If it weren’t such a sacrilege to tempt children with sugar in exchange for eating their vegetables, this would be the ultimate temptation. You may need to keep this stuff on the top shelf of the fridge tucked way in the back if you plan to actually use it for anything…otherwise you run the risk of it mysteriously disappearing. I’m even having a hard time keeping it away from myself! This sauce is no joke – it’s rich and smooth and hits on every single reason why you fell in love with caramel sauce as a kid in the first place. When chilled, it’s a thick sauce that can be dolloped or swirled into brownie batter. When slightly warmed, it’s pourable or spoonable for drizzling over ice cream (brownies a la mode anyone?) or a slab of warm apple pie and it can be added to frosting for genius creations like these. 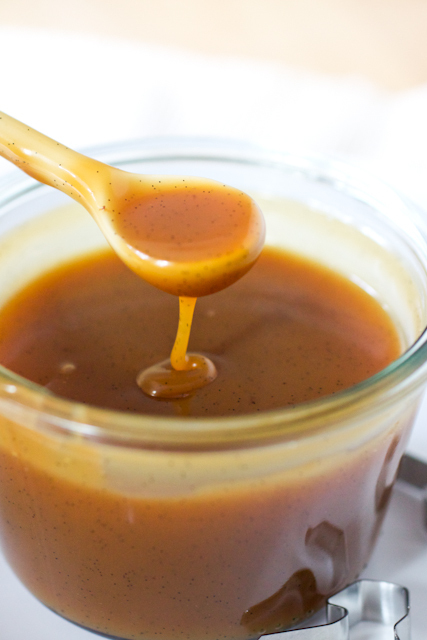 If you’ve still never made homemade caramel sauce, what the heck are you waiting for? Please make this your first attempt – it takes no more than 10 minutes to make and I can pretty much guarantee that you’ll never ever go back to buying jarred, store-bought caramel sauce again. And wouldn’t it go just awesomely with some of that hot fudge sauce that you’re making at home now? Measure the heavy cream in a 2-cup liquid measuring cup and add the seeds of the vanilla bean; set aside. Spread the sugar out in an even layer in the bottom of a heavy saucepan. Heat the pan to medium-low and when the sides of the sugar begin to liquify, start slowly stirring the sugar together until all of the sugar has melted and only liquid remains. (Lower the heat to low if the sugar or liquid sugar begins to brown too quickly. If the sugar clumps, turn the heat to low and let it melt – try not to stir it so it has a chance to heat up slowly.) Once the liquid reaches a deep amber color (you can check this by dropping a little onto a white plate), remove the pan from the heat and slowly pour half of the heavy cream and vanilla been seeds down the side of the pan and whisk it vigorously into the hot liquid. Take care – the hot liquid will bubble violently! Whisk in the remaining heavy cream and seeds and then the salt and vanilla extract and whisk the mixture until the cream has fully incorporated itself. If the sugar rehardens into clumps at this point (like mine did – lots of sugar clumping went on that afternoon), put the pan back over medium-low heat and whisk the mixture until the sugar melts back into the sauce and the sauce is completely smooth. This may take a couple of minutes but it will come together – be patient. Let the sauce cool for a few minutes on the stove then transfer it to a heatproof container (mason jars work great for storing this sauce). Store in the refrigerator for up to 1 month. This sauce sounds awesome! Love this idea! Yum! Love the addition of the vanilla bean. It makes the caramel so pretty! My goodness, I want to drizzle that into my coffee right now! I love how you added vanilla bean to caramel sauce! I agree with Annie, I would love to drizzle this in my coffee! I’m not even a big caramel lover, but I want to lick that spoon. Like right now! This does sound *sinfully* good. It is ripe peach time in NH and I plan to raid the orchard next week. This could be a new item with the other 16 flavors of jams and marmalades that I show at Old Home Days. Ken: Oh yeah….this sauce with peaches would be amazing! You aren’t using any butter at all ?? Looks wonderful with the addition of the vanilla bean, though ! Denise: Nope, no butter in this recipe. Mindy: You’ll have to look up specific canning instructions if you want to preserve/can/jar caramel. i tried to make this caramel sauce and for some reason it is slightly bitter. I didnt burn the sugar thats for sure, i just dont get what I’m doing wrong? If it was bitter, you either cooked the sugar for too long or the caramel itself for too long. Was the sauce on the dark side? Having a good sauce pan that heats evenly is very important. Its a nice sauce but difficult for me at the sugar melting process, it was nerve wracking to keep it from crystallizing. It is a little nerve-wracking, I agree…but if it crystallizes, just keep heating and stirring it over low heat. The sugar will melt and start to caramelize. Bit of a weird question I know but how many litres / millilitres does this make? I don’t know because I don’t measure in liters but you can do a quick Google search to find the conversion. This was quite challenging, but the second go around proved much more successful. I put it back on the heat when it started to crystallized and it smoothed out, but now it won’t thicken up! It’s sitting in the mason jar slightly warm but no way thick enough to drizzle. Any suggestions? I had some trouble with this recipe too the first couple times around but you did the right thing by letting the sugar crystal melt down – great job! The sauce thickens as it cools (which you’ve probably figured out by now. 🙂 Hope you liked the cupcakes! There are so many things so beautiful about this picture…the mini spoon, vanilla specks, that luscious, and oh yea, the weck jar.